Harvey Shafer is not often mentioned among the early Oregon wine pioneers but he should be. In 1973 he chose a Gales Creek Valley hillside near Forest Grove to establish his vineyard and winery, Shafer Vineyard Cellars. He was (figuratively speaking) plowing new ground since vineyards had never been planted there. He bonded his winery in 1981. With the help of his wife, Miki, and a lot of hard work, he was successful and well known for producing high quality grapes and many fine wines. 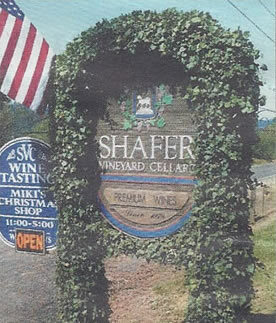 The Shafer family continues to operate the winery which is located at 6200 NW Gales Creek Rd, Forest Grove, OR. An attractive tasting room and two acre picnic area welcome guests.